With our thanks to vase expert Joan Doty for her help. What actually is a vase? The derivation of the word “vase” implies simply, a vessel. Glass vases are some of the earliest glassware found in history, the first evidence dating back to Mesopotamia in the 16th century B.C. In the past they have been used as containers for wine and other substances such as grain. Today we use vases primarily for flowers or simply as decorative objects in themselves. ​Vases were one of the earliest shapes made in Carnival Glass, the Butler Brothers catalogues being a wonderful source to help pinpoint the timeline of Carnival vase production. In September 1908, what is believed to be the first known advert for Fenton’s Carnival Glass appeared. 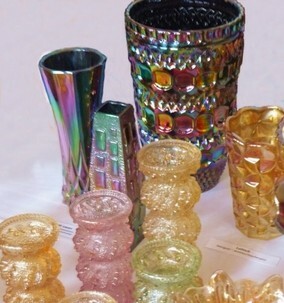 Described as a “Golden Sunset Assortment” the ad showed 15 different items, among which was a familiar vase: Fenton’s Diamond Point Columns. It wasn’t long before Northwood’s Carnival vases appeared on the market and in 1909 two familiar patterns were shown in Butler Brothers catalogues: Fine Rib and Diamond Point. In the same year another Fenton vase, Long Thumbprint, was illustrated in their ads. ​A year later, in 1910, Imperial adverts started to appear, featuring their Rococo and Morning Glory vases, and then Ripple is shown from 1911, as part of a "Newest Art" Assortment - as shown on the right. ​The Butler Brothers ad clearly did not do justice to the real item - as shown by Joan Doty's picture of her fabulous selection of purple Ripple vases, below. In the same year, 1911, the short-lived Millersburg factory had an ad showing a vase: Rose Columns vase, as below - $2.10 for a dozen pieces! By 1912, the Millersburg factory had finally closed (in May), but the other Carnival Glass makers were producing an increasingly varied selection of items to tempt the buyers of the day. Two of Northwood's popular vases, the Corn vase and Daisy and Drape vase appeared in 1912, as shown below. It was 1913 before Dugan’s vases first appeared in Butler Brothers catalogues. The absence until that date was most likely a marketing decision and should not be taken to mean they weren’t actually producing Carnival vases until then. When they did appear, they were shown in the colour we know as peach opal, and they featured three familiar patterns: Target, Wide Rib and Pulled Loop. ​Europe was on the Carnival scene around the same time; we have catalogue proof that Brockwitz in Germany was making Rose Garden and Curved Star vases in Carnival Glass as early as 1915 and possibly earlier. Vases were one of the earliest shapes to be made in Classic Carnival, and they also feature among the final shapes to appear. In 1929 Imperial’s Ripple and Dugan-Diamond’s Pulled Loop vases were both included in Butler Brother’s catalogues. And the prize for the very last Classic vase to appear in those catalogues goes to ..... Dugan-Diamond. The date was 1931 and the vase was the Beauty Bud vase. It helps to divide vases into two broad groups: swung and “as moulded”. Swung vases are classed by the size (diameter) of their base as this is determined by the mould base plate and thus is constant. They are not classed by height, as it would vary with the “swing”. The majority of vases made in the Classic era in the USA were swung vases, in fact over sixty different patterns of swung vases are known. ​The process by which they were made was as follows: the molten glass in the form of a hot metal gob was dropped into the mould and pressed, then removed from the mould by being “snapped up”. 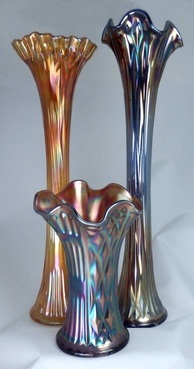 While clamped by the “snaps” the vase was reheated in the glory hole and then swung while the glass was still pliable (“plastic”) after which it was iridised and then put in the lehr to cool. The patterns on most swung vases are generally abstract, as a figural pattern would be distorted by the swinging. Thus we see hobs, bumps, lines, circles, diamonds, curves and loops all used in swung patterns. The design is on the outside of the vase, of course, although there are exceptions where an interior pattern can also be found on swung vases: Fenton’s April Showers (which sometimes has the pretty Peacock Tail pattern inside) is a are good example. The vases pictured on the immediate right were part of a display we organised for the CGS (UK)'s annual meeting in 2009. Members brought some amazing vases to show: we were amazed to see the purple Dugan Panelled Treetrunk jardinière (centre of the picture) and the Fenton Flute vase in celeste, which is behind it, to the right. They are both very rare vases. We have written more about the Flute vase here. A funeral vase that has not been swung is called a jardinière - an example can be seen in the centre of the display above. It is a purple Panelled Treetrunk jardiniere made by Dugan-Diamond. This is a rare vase, and this one is the only one we know of that has been found in the UK. There is a wonderful variety of swung vases. Some vases were only slightly swung (and often are called "squatty vases). The picture above of three Fenton #916 (Nine sixteen) vases dramatically shows the effect of being swung! 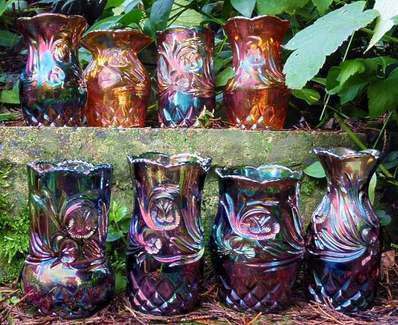 We have a major feature all about Carnival Glass Swung Vases by Carnival Glass ​vase expert, Joan Doty. “As moulded” vases take on the shape of the mould, without subsequent swinging or lengthening. 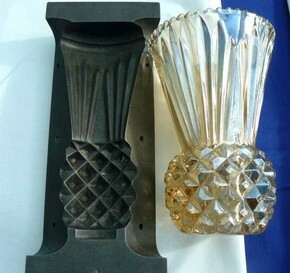 The top can be shaped in various ways, as shown by the display of Western Thistle vases, below. The pattern on “as moulded” vases is not distorted by swinging and thus there is a wider range of designs often featuring motifs such as figures, flowers, fruits, birds and geometric shapes. “As Moulded” vases were made by most makers in all the Carnival producing countries, with the possible exception of Australia. It’s worth pondering at this point why virtually no swung vases were made in Europe. It’s possible that practical considerations such as the cost of an extra process (the swinging), or something as fundamental as the thickness of much European glass, could have been behind it. Also note that the snap tool was not used as much in European Carnival production, the glass was “stuck up” instead (fixed to a punty by a dab of molten glass). It’s likely that the weight of the heavy glass vase stuck on a punty would, quite simply, mean that the vase would not be able to be “swung”. It would simply break off the punty. 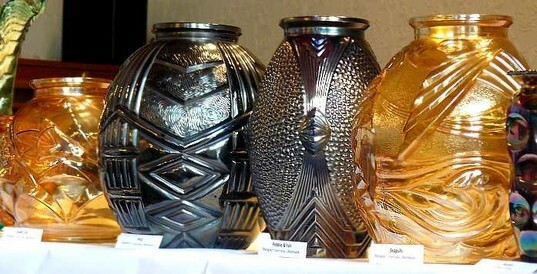 A selection of "as moulded" European vases is shown on the right - they were also part of the CGS (UK) 2009 vase display. Foreground: Starburst (Riihimaki, blue); Svea (Eda,blue and marigold); Rose Garden (Brockwitz, blue); 2 sizes of Fleur de Lys (Inwald, marigold). Backgound: Bishop's Mitre (Riihimaki, marigold); Sunflower and Diamond (Eda version, blue); Balmoral aka Heavy Vine (unknown maker, probably Czech, marigold). "As moulded" Western Thistle vases, each with different top shaping. “As Moulded” vases were usually press moulded, but could also be blow moulded, depending on the shape of the finished article. The usual press moulding technique relies upon the vertical motion of the plunger within the mould. For this to work, the sides of the mould have to be either vertical, or wider at the top than the bottom, to facilitate the removal of the plunger. 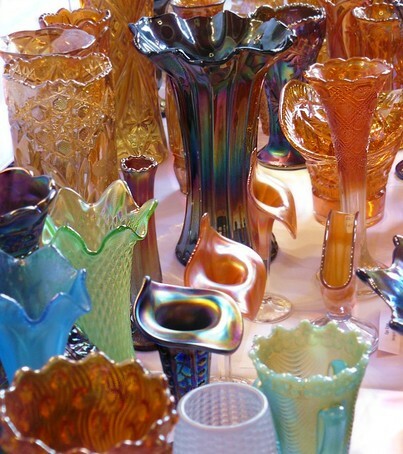 There are Carnival Glass vases that could not have been made this way—bulbous-shapes, vases with wide, curvaceous shapes, or vases with deeply sculptured patterns—such as Imperial’s Poppy Show, and the Seagulls, Pebble and Fan and similar vases which were made in Czechoslovakia. See these amazing Czech bulbous vases here. They were made by a blow moulding technique whereby the hot metal was forced into the mould with the assistance of pressurized air. 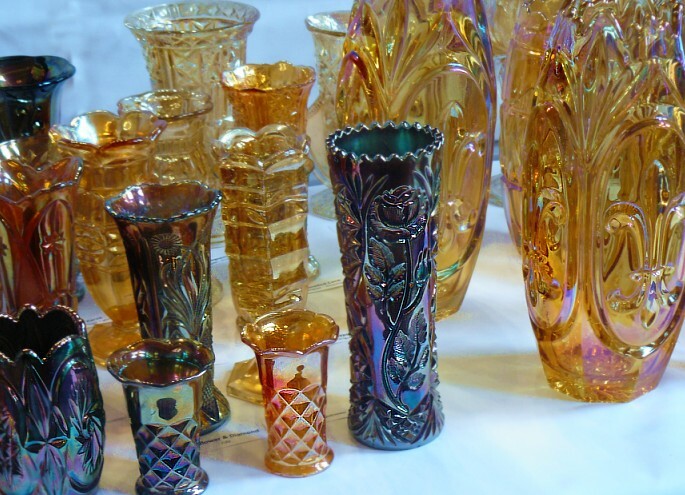 The size of “as moulded” vases varies from the exceptionally tiny (such as the miniature Thistle vase from Canning Town Glass Company) up to massive items like Millersburg’s Peoples vase and Imperial’s Poppy Show vase. Because the “as moulded” vases are not swung, their heights can be used as an aid to classification, however we don’t have specific groupings as with swung vases. The shape of “as moulded” vases is usually more or less cylindrical, but there are also other shapes such as oval (letter vases) and square, plus of course the bulbous forms of the blow moulded vases. Although the two basic groups of vases are as shown above, it’s useful to mention a third, albeit very much smaller category, that of whimsy vases. 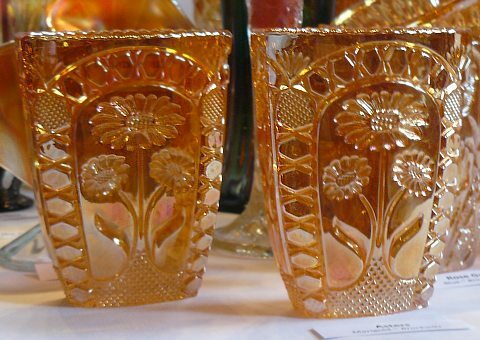 These are items such as pitchers made without a handle to become a whimsy vase or items such as tumblers or spooners that have been shaped into vase whimsies. Further shaping can take place on both swung and “as moulded” vases, for example, incurved “tulip” tops, tight crimping, ruffles, points, flares and Jack in the Pulpit (JIP) forms. A brief deviation to look at JIPs may be interesting, as there’s a local connection. The origin of the JIP shape on vases is often wrongly credited to Louis Comfort Tiffany in around 1900. Although Tiffany almost certainly gave the style the name Jack in the Pulpit, it’s possible that the style was first developed in Harry Northwood’s original workplace—Stevens and Williams in Stourbridge—some decades before Tiffany used it. The JIP shape is characterised by an open mouth with the top shaped upward and the lower part shaped downward – like the JIP plant (a form of arum lily, or “lords and ladies”). Most USA Carnival makers produced a JIP shape and indeed, Fenton continues to this day. Although the shape most likely originated in the UK, it wasn’t used on English Carnival, simply because there was very little hand finishing and it didn’t fit the “as moulded” style. However, you can see it used on contemporary studio glass made in the UK, for example, Alum Bay Glass and Isle of Wight Glass. The CGS (UK) 2009 vase display had an amazing selection of quality vases, representing virtually all Classic Carnival Glass makers from all over the world - as shown in the pictures on the right, and below left. Centre stage in the picture on the right is an Australian Gum Tips vase in black amethyst from Crown Crystal. You can also see tantalising glimpses of a host of other lovely vases: Dugan’s Formal, Northwood’s Diamond point (in ice green), Fenton Flute (in celeste), Millersburg Hobnail Swirl (aka Swirled Hobnail), Brockwitz Tartan and a Brockwitz Bremen vase. If you are eagle-eyed you may be able to identify some other splendid pieces too! There was also a very wide range of Carnival glass colours on show, including celeste, red, aqua opal, ice green, white and lime green opal, to mention just a few of the unusual colours that were on display. It was very interesting to see them broadly grouped by maker and country: you could actually see the “family” resemblance and common signature characteristics. We did a series of vase interviews for the CGS (see the Newsletter number 128, July 2009), and it was pretty clear that two groups of favourites kept cropping up. One was Imperial’s purple vases with that sizzling hot iridescence they often have, while the other broad group was European vases from makers like Brockwitz and Eda, plus those fabulous, Czech bulbous vases like the Seagulls. The CGS display included what we believe is the full complement of the Czech bulbous vases, as pictured below. Grouped together like this, it was clear that they are all from the same maker as they all have a bold and sweeping Art Deco style, plus an identical and very distinctive neck and rim mould structure. We know they are Czech because of the etched CZECH mark on the base of the Giant Lily vase. So who made them? Find out here. There were some very unusual examples on display from Sowerby and Canning Town Glass Company. Through the late Bob Clements (a well known CGS member) we have an important link with Canning Town Glass, as Bob used to work there. 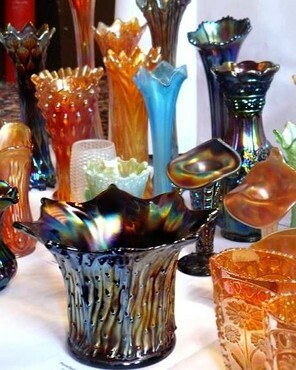 Thanks to him, the mould for the Thistle vase, pictured above right, now resides at Broadfield House Glass Museum. Canning Town Glass Company was predominantly a bottle making works. Now stop a moment and look at the Thistle vase. Although it gives the impression of being press moulded, it couldn’t have been. Look at the shape! How was it made? There is no way a plunger could have been used as it couldn’t have been removed. The clue is in the fact that it was made by a bottle making works. Think of a milk bottle (its shape is narrower at the top). The entire process of bottle making is almost fully automated. A feeder separates a stream of molten glass into individual gobs which are then dropped through tubes in a moving track. The gob is shaped into what looks like a short bottle with thick walls and is called aparison. This is transferred to a final mould made of iron, which moves up and clamps around the glass. Air is blown into the glass till it acquires its final, moulded shape at which point the bottle is then released and annealed. We certainly do see a wide range of rare items – some of them are even rarer than the Peoples vase – and there was an amazing variety of rare and unusual vases brought in by CGS members for the display, and a selection of contemporary vases. There were some splendid Brockwitz vases that have been found here such as the Asters oval vase and the Tartan pedestal footed vase. Smoke vases in the Royal Pineapple and Thistle patterns (plus a teeny, tiny miniature Thistle in marigold) and the Czech bulbous vases (with the exception of the Giant Lily) have all been found in the UK. Quite a wide range of scarce Czech vases that were produced by the “Unknown Maker” such as the Regal Tulip were also on display. 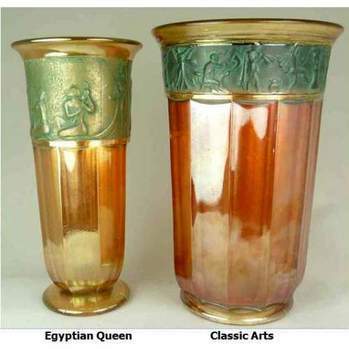 There were also examples of Rindskopf items such as the Classic Arts vase and Egyptian Queen. Some other exceptionally rare items that were not in the display but we do know they’ve been found here are a pair of Fenton’s Fine Rib vases in celeste blue and a Northwood ice green Tornado vase (the only one so far known). We felt it would be interesting to take the opportunity to show these. They are not quite as old as the main bulk of European Carnival (which goes back to 1915 or possibly even earlier) and stretched to around the 1930s. These more recent examples were made in the 1950s, 60s and the early 70s. Foreground: Pastel soap bubble shades of lime, pink and marigold can be seen on the Cascades vases made by Oberglas of Austria. Background: Behind them are the vivid and vibrant colours of fabulous vases made by Leinauer Glaswaren (LGW). On the right is a delightful, marigold Luttich vase from August Walther and Sons. Two vases from Sklo Union were also on display. The first was the Lily Of The Valley vase that was originally designed by Rudolf Schrotter (the famous Inwald designer). We are not certain when or where this was made and iridise. We suspect it might have been made at Hermanova Hut. The other Sklo Union vase in the display was the Brick Vase designed by Jiři Zejmon and made at Rudolfova Hut in 1969.